What’s happening to special immigrant visas under the Trump administration? Fahad Al Nimah fled the city he called home on a beautiful summer day in 2004. Imagining they would be home within a week, Al Nimah and his wife packed a single bag of clothes and drove north in Iraq from war-torn Baghdad to Kurdish territory. They listened to music with the windows down. They felt that there was hope once more. Al Nimah was 21 years old. Weeks turned into months. Months turned into years. Returning to Baghdad remained impossible. Click on the image to go to the official State Dept. Special Immigrant visa site. Al Nimah came to the U.S. on Aug. 17, 2016, on a Special Immigration Visa. 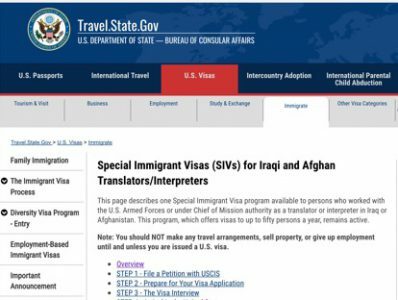 The much-smaller Iraqi side of the Special Immigrant Visa program was not renewed. Of the initial 2,500 visas allotted, there are enough Special Immigrant Visas remaining for everyone who submitted their applications before Sept. 30, 2014. The program is set to end when all those who applied before that deadline have received visas. The State Department could not give a clear number of Iraqis who currently work for the U.S. government. Al Nimah applied for a Special Immigrant Visa after working for USAID, a U.S. agency that promotes development and democracy abroad. His work wasn’t political. He arranged hotels and events for visiting diplomats, but his fellow Iraqis took out their anger about the political system on the most readily available target: Al Nimah and his young family. The visa application process took years, but finally, they got the O.K. His daughter has adjusted well to life in America. Her main beef with her new country is that, at 9 years old, she is not allowed to vote. So Al Nimah joined Upwardly Global, a nonprofit organization that helps immigrants and refugees with professional backgrounds navigate the American job market. “In the beginning, the struggle is real. You apply and you apply, and it’s like applying to a black hole. No one is even responding to you.” For a while, even the always-optimistic Al Nimah almost lost hope. It was American hospitality that kept him going in those dark moments. “From the moment the immigration officer told me ‘Welcome home’ to being in a bus and asking for directions and not one but a few people jumped to tell me,” Al Nimah experienced nothing but kindness, curiosity and acceptance from his fellow Chicagoans. With the help of his job coach at Upwardly Global, Al Nimah learned how to tell the good jobs from the bad ones, how to network in America, and how to tell a story that made his history an asset to his new company. He began working at Refugee One, another nonprofit that helps immigrants find work, and soon, he found a job, back at Upwardly Global, this time as an employee. 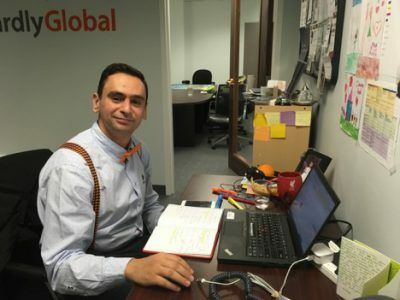 Fahad Al Nimah at his desk at Upwardly Global. Now an onboarding associate, Al Nimah has come full circle. The hardest thing for new immigrants, he said, is feeling that “they are burdens on the system, and they want to be assets on the system.” In his current role, Al Nimah helps people like him find meaningful work and contribute to their new society. Once those still waiting for their visas find a new home in the U.S., the Special Immigrant Visa program will close. Other Iraqis who risk their safety to work for the U.S. government will have to wait in line for other immigration opportunities, just like everyone else.